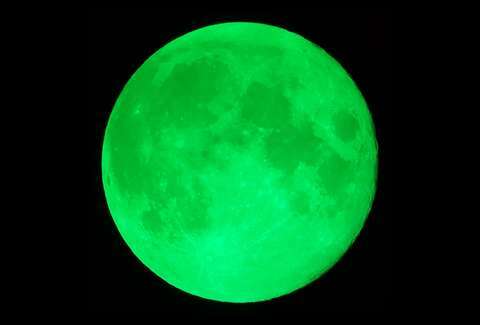 It is difficult to write these words, but no, contrary to the rumors you've heard and memes you've seen on social media, there will not be a "Green Moon" in the sky tonight. The Earth's only moon, a desolate mass of rock hanging in the our orbit some 238,900 miles away from human civilization, does a lot of things. None of those, however, pertain to it turning green. The timing of these rumors is very telling. Today is Friday, April 20, aka 4/20. This date signifies and valorizes the smoking of marijuana, which is typically green, much like tonight's supposedly rare moon. According to legend, this supposed moon only appears every 420 years. According to the memes, it occurs when "several planets" align, causing the moon to appear green for 90 minutes. It is billed as an ephemeral sight that you don't want to miss. For whatever reasons, some people believe the moon will actually turn green tonight. After all, it's on the internet and therefore an infallible truth. This is apparently an old chestnut dating back to 2016. There are Reddit threads from that year attempting to spread the hoax, but most people who came across them weren't that gullible. Can't say the same for some other folks! The Green Moon has caused enough of a stir that fact-checking sites like Snopes have dedicated time to demystifying this nonsense. The site claims that the rumor got started on Facebook, and has only grown from there. Fact Check: Will a ‘green moon’ appear this month? So in short, when you're out tonight and presumably smoking marijuana, don't expect to see the Green Moon. As stated previously, these words have been very difficult to write.